You will be given a Free reference e-book to read which has 723 pages And the test will be based on that e-book. Alcatel Lucent scalable IP networks certification can be defined as a type of certification which is often offered to professionals as a starting point for those who plan to undergo more extensive programs related to running these IP networks. It is also designed to certify the impressive skills, solid background and comprehensive knowledge of IP professionals in using Ethernet and IP technologies. It also works in establishing a stronger foundation for network routing specialists and architects who plan to further boost their comprehension about how the Alcatel Lucent scalable IP networks work. It can incredibly extend your knowledge and reach especially if you plan to become one of the most efficient networking professionals at present by providing you with a more comprehensive demonstration about the basics of building more scalable and smarter networks. If you get this certification, then it would be easier for you to prove your skills and expertise in effectively developing and designing scalable systems. It can show the industry that you are fully knowledgeable about the pitfalls that you need to avoid when developing scalable networks, the most effective and powerful techniques that you can use to build and operate IP networks and the basics of running the internet, IP layer and IP routing. Fortunately, Brainmeasures free Alcatel Lucent scalable IP networks practice course is now around and its free study guide and practice test are your ultimate key towards confidently taking and passing the actual certification test. 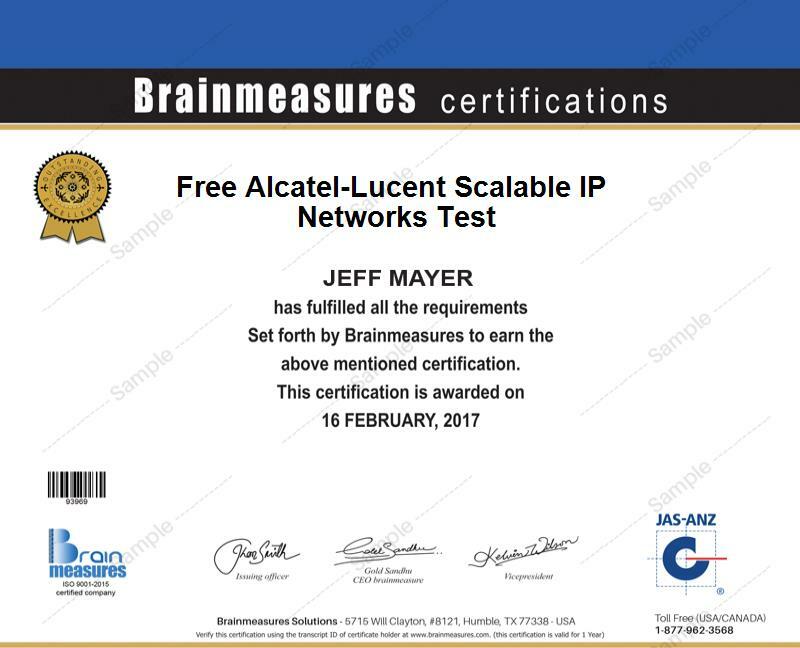 The free Alcatel Lucent scalable IP networks certification practice course which is now introduced by Brainmeasures to the public is guaranteed to be highly comprehensive so you have a hundred percent assurance that you will learn everything about the field fast. This free practice course comes with the most detailed and accurate free study guide which lets you understand everything about building scalable IP networks, the major purposes of the most commonly used Layer 2 technologies and how these are operated, the steps and procedures involved in the IP forwarding process, the basics of building IP address plans with the help of IP address summarization and IP sub-netting, the major characteristics of the most dynamic protocols designed for routing and other useful topics designed to help you confidently ace the certification exam. The good thing about this popular online certification practice course is that it also features a free practice test which is primarily designed to let you fully understand how the actual certification test works and how you can successfully pass it. The free Alcatel Lucent scalable IP networks certification practice course developed by Brainmeasures is proven to be really amazing considering its effectiveness in meeting the needs and demands of various individuals and professionals. You can expect this free practice course to work even more favourably for all aspiring and existing networking professionals including architects, designers, consultants, administrators, engineers and technicians. The Alcatel Lucent scalable IP networks certification that you will receive right after passing the certification exam is also your key towards earning an even higher salary. Your certificate is helpful in acquiring the position of an Alcatel Lucent network consultant to earn around $69,000 to $116,000 yearly. Grabbing the position of an Alcatel Lucent network and software engineer also entitles you to receive up to $170,000 every year.